Los Angeles Dodgers' South Korean starter Ryu Hyun-jin has left his start early with a left groin strain. Ryu lasted just 1 1/3 innings against the Arizona Diamondbacks at Chase Field in Phoenix on Wednesday (local time), with the Dodgers ahead 1-0. After throwing a 0-1 cutter to Deven Marrero in the bottom of the second, Ryu came up hobbling. After a brief chat with manager Dave Roberts and training staff, Ryu walked off the mound. Ryu tried to stretch his left leg but looked to be in some discomfort. 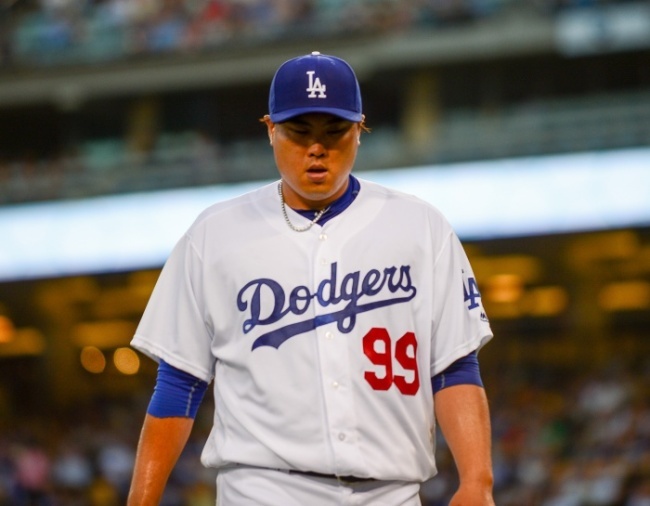 It was Ryu's shortest outing of the season, and the second shortest of his career after a one-inning start against the San Francisco Giants on Sept. 12, 2014. The Dodgers threw five relievers at the Diamondbacks and hung on for a 2-1 victory, snapping their four-game losing streak. Those five pitchers held Arizona to five hits and struck out nine over the final 7 2/3 innings. The left-hander came into the game riding a hot streak, with a 0.73 ERA over his past four starts, a span of 24 2/3 innings. He also missed out on a chance to redeem himself against the Diamondbacks, who touched him for five hits and three runs in 3 2/3 innings on April 2. Ryu issued five walks in that shaky outing but had been a completely different pitcher until the injury bug bit him in this game. Ryu struggled with command early on, missing the strike zone with seven of his first 10 pitches. But he worked around a leadoff walk to David Peralta with two strikeouts, including one against All-Star first baseman Paul Goldschmidt. Ryu got a weak ground out off the bat of Ketel Marte to start the second, but his day came to an abrupt end after two pitches to Marrero. Ryu lowered his ERA from 2.22 to 2.12. He now has 36 strikeouts in 29 2/3 innings. Ryu, who joined the majors from the Korea Baseball Organization in 2013, missed the entire 2015 season and made just one start in 2016 after shoulder and elbow surgeries. After an up-and-down 2017, Ryu was leading the injury-plagued Dodgers in wins this season until Wednesday's injury. The Dodgers are already without All-Star shortstop Corey Seager, who faces a season-ending elbow surgery. Third baseman Justin Turner hasn't played this season after suffering a broken wrist in spring training. Logan Forsythe, who was supposed to fill in for Turner, has been out for three weeks with a shoulder injury.